Why CHP Recommends Balancing your Small Block Ford at 28oz. over 50oz. Although Coast High Performance has plenty of experience in balancing your rotating assemblies and builds to whatever requirements you prefer, we highly recommend choosing an external 28 ounce balance over a 50 ounce balance in Small Block Ford applications (unless you have purchased an Internal balance crankshaft). In the late model 5.0 builds, Ford's factories primarily utilized 50 ounce balancing. The 50oz. cranks used in these builds were designed entirely different from today's aftermarket performance crankshafts; the primary difference is in the size and material content of the counterweights. These cranks were designed to be economical, utilizing less material in the crank (notably, smaller counterweights) in order to lower manufacturing costs, as a result allowing only a 50 ounce balance. 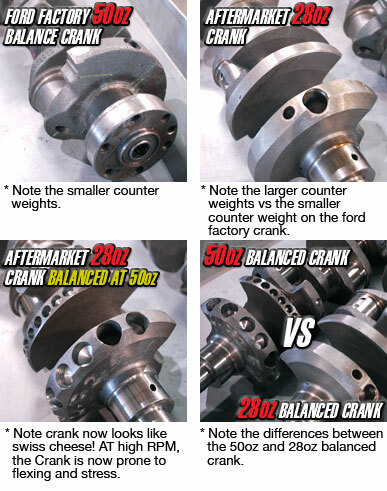 Today's aftermarket crankshafts were designed primarily with 28oz. balancing in mind. There is much more material in a 28oz. crank than a comparable factory 50oz. one (see photos below)--the difference being that crankshafts designed for 28oz. balancing utilize full counterweights and less end-weight for better stability, thereby improving the structural integrity, strength and performance capability of the crankshaft. While it is possible to balance an aftermarket crankshaft to 50oz, the amount of material that must be taken out will leave the crankshaft heavy at its ends. At high RPM use, this leaves the crank prone to flexing and stress at its center. This problem is greatly minimized using a 28oz. balance, as it keeps the integrity of the crankshaft intact since less material will have to be removed from the counterweights. Another reason why we prefer to use 28oz. balancing is because the extra holes drilled into the counterweights of a 50oz-balanced crank will cause aeration of the oil, minimizing its life and increasing engine wear over time.